Have you ever noticed that owls have big eyes? That’s because they live at night. During the dark, you need really big eyes to see anything at all. The bigger your eyes, the more light they collect. Bigger eyes are more sensitive. And there’s more. If your eyes are bigger, you can see smaller things. A spider has very small eyes. That’s why he only sees blurry pictures. Owls have bigger eyes, so they can see much sharper. Bigger eyes reveal more detail. A telescope is an artificial eye to study the Universe. So with telescopes, it’s the same as with eyes. Bigger telescopes are more sensitive, so they can see fainter stars. And bigger telescopes also reveal more detail. No wonder that astronomers always want to build bigger and bigger telescopes! Building a very big telescope is difficult, and expensive. But if you have two or more small telescopes, they can work together as a single bigger one. Binoculars work like that – maybe you have them at home. They’re in fact two small telescopes connected to each other. Together, they catch the same amount of light as one bigger telescope. A pair of binoculars is a telescope with two eyes. ALMA goes a step further. ALMA is a telescope with 66 eyes. So ALMA is very sensitive. But what’s more: the ALMA antennas can be spread out over a very large area. They act like small pieces of a very big eye. That means that ALMA can see extremely fine details. 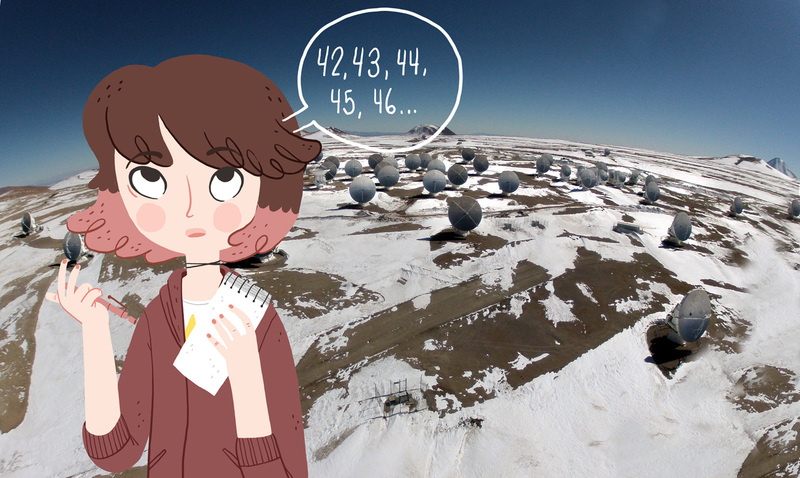 ALMA has the same incredibly sharp eyesight as a single antenna of about sixteen kilometers across! Of course, it would be impossible to build such a huge antenna. The ALMA antennas can be moved around. If they are close together, their eyesight is not that sharp, but they can see a larger part of the sky. It’s like using a wide-angle lens on your camera. If the antennas are far apart, they can only stare at a small patch of the sky, but with eagle-eyed vision. That’s like using a telephoto lens. In fact, ALMA acts like a single giant zoom telescope. Now if you thought 66 is a magic number, you’re wrong. You could do the same trick with 44 antennas, or with 88. Who knows, in the future ALMA might be outfitted with more antennas. That would only make the observatory even more sensitive and powerful.